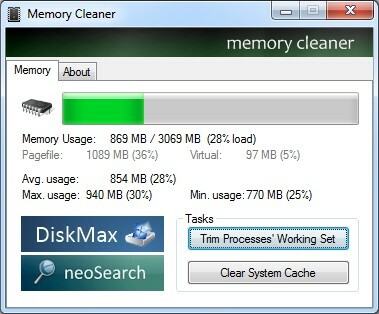 Memory Cleaner is considerably better because it uses functions built into Windows to judiciously free memory – with no performance impact whatsoever. You can now access Memory Cleaner functions from the tray icon without having to open up the main window. The cleaning prodecures are both silent and the only alert you will see is the amount of RAM recovered briefly displayed in the window.